Omega has acknowledged the 54th anniversary of the Apollo 11 moon landing with a special edition timepiece that looks, frankly, amazing. On July 20, 1969, astronaughts Neil Armstrong and Buzz Aldrin stepped onto the lunar surface. Four days later, the command module splashed into the Pacific Ocean, returning the astronaughts to Earth and completing the Apollo 11 space mission. 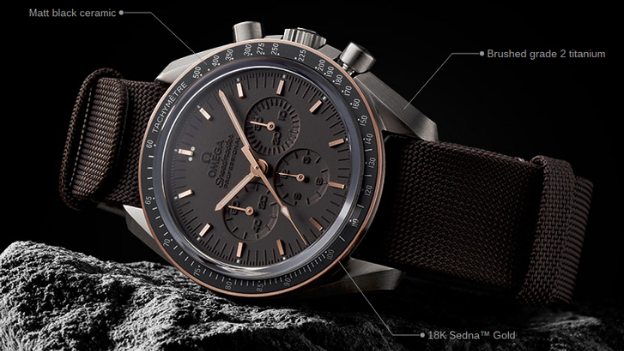 Now, forty-five years later, Omega has announced a limited edition model of the Omega Speedmaster Professional that Aldrin wore during the Apollo 11 mission. It's come to be known as the Moonwatch. And it's no coincidence that the new model includes 1,969 pieces. The new Speedmaster features a case crafted from lightweight grade 2 titanium, boasts a manual-winding chronograph movement and water resistance up to 50 meters. "Recalling the colours of the moon and the Apollo 11 lunar and command modules, this Limited Edition timepiece features a 42 mm completely brushed case with a touch of gold," says Omega on its website. Equipped with a nylon fabric strap, the watch comes its own special presentation box and costs an astronomical £4,860. Check out the video below for a better view of this awesome looking timepiece.